« Painless by Rasputin – Crackerjack!! I suppose it was intended for us to recall Pieman’s 10 by 8 from October 2008 as we saw this puzzle, and to know from the outset who we were dealing with. Well, the ploy worked 100% with me. The title, the grid, the clueing device and the preamble all seemed to have the Pieman hallmark. I just hoped that the endgame wasn’t as fiendish as his 2008 offering (what turned out to be entitled Digonal stumped me), or at least if it were that fiendish that I would be up to the challenge. So, I had made a start by drawing a line between the Across and Down clues! I was sure that I’d come across the clueing device whereby one or more consecutive letters had to be removed before they could be solved, and I thought it was in a Pieman puzzle. I looked forward to the challenge that they posed as it seemed like fun. I got a few answers over the first half hour or so, including TUBED near the top, and ACERBIC, REMUS, ANGLE and KAIKAI near the bottom. This last one took a few minutes to confirm as it is found under KAI a bit above where it should be, but with no cross-reference. The bottom was looking promising, but a shame that the top looked less so. I pencilled these words into the grid, with TUBED and REMUS symmetrically opposite in rows 2 and 7. In some cases, there were two ways that a set of letters could be removed to make a clue work — such as in the case of REMUS, where RAF aerodrome became Rome. I initially thought that ‘AF aerodr’ would be dropped, but I was wrong. Another half hour later, and I had more down entries to go in, including CAESAREA, ENTERS, ANIL, YERK and EUK. I had placed ANGLE under ACERBIC, although that would result in a G following a B in column 5. This was a timely reminder to look out for the nine clashes in the grid. With the grid beginning to fill up, I was quite pleased with my preogress. 1ac was still bothering me though: Joint Chiefs of Staff open loophole to kill. I didn’t know if it was going to be ‘joint’ or ‘open’ which had the extra letter. I was leaning towards ‘open’ with a loophole in ST (first two letters of ‘staff’) to give a word meaning kill. It was only when I got 1dn SHADCHAN that S[TAFF] P[EN] L[OOPHOLE] + ICE appeared … what a nicely devious clue. I suppose that solving the third down clue early would have sped up my solving: Once attending reception of Verhoeven, cut one in German government. It was pretty obvious that ‘Verho’ would be lost. I toyed with using ein or eine (or possibly even einem or einen!) as the German ‘one’. I also tried UN (one) in G (German) G (government) to give a German sort of word ending in …GUNG. Of course, it didn’t help that this entry had three of the nine clashes and turned out to be LEVEEING, comprising LEVE[L] (even, cut) + EIN (one in German) + G (government). It was well over two hours in that I saw eigh and squar as part of the message in the second column of clues, and working back I could see five and three and one trying to get out. A few simple guesses, and one one two three five eight squares enabled me to finish off the grid, and good old Fibonacci was revealed as the driving force behind the puzzle. For those who have been wondering what’s going to happen now that Chambers has lost its Some first names appendix, that seems to have been answered in this puzzle: imagine it’s still there!! The ninth across clue (OK, it’s 22ac, but see what I mean about the absence of clue identifiers being a pain to bloggers?) Duke leaves dowry, following knowledgeable man gave ARID (dry, ie dowry without the ow) – D (duke) + F (following) to give an Arabic name meaning knowledgeable. I suppose the trickiest clue was the fifth across: Mushroom dish having won out after cooking rival rinsed a missing piece of lamb, which lost ‘nsed’, and was STEW (dish) – W (won) after ((RIVAL RI – L (piece of lamb))* … ARRIVISTE, an upstart, and requiring you to look up mushroom to see that one of its definitions is also upstart. It didn’t take much effort to realise that the letters chosen for the clashes were those which revealed Fibonacci’s in the nine cells., and I felt I was lucky in remembering the way that squares of the numbers could be built up into ever-larger rectangles. Thus the division of the grid into squares was also straightforward. Finally, the extended sequence had to be identified, and this was found by starting in square one and stepping forward in a Fibonacci sequence. What a relief that the first six squares read out SPIRAL, leaving six more letters to spell out PIEMAN. But the next letter was an S rather than a P! I double-checked my stepping but it was definitely S, and was followed by A then M … and a realisation of who I was dealing with. Yes, it was SAMUEL. All that remained was for me to fill in my submission. First of all I put in the entries. Then I drew the dividing lines to mark out the Fibonacci squares; that was easy with a ruler and a thick red pen. Then came the shading of SPIRAL and SAMUEL, and finally the spiral line that linked the letters of the mathematician. Well, that’s where it went a bit pear-shaped. 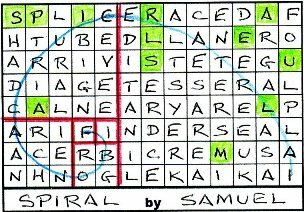 I remember getting the last Listener spiral wrong, in Pointer’s Crovvword. This time, my attempt at a smooth, correctly-proportioned spiral wasn’t too hot, but I wasn’t going to repeat all the effort I had put in up to that point. The line went through all the correct letters, which was important, but I felt any other failing would be forgiven. As far as I can see, Fibonacci has appeared in three Listeners over the last twenty years, and as many Magpies in the life of that magazine. I cannot identify any Inquisitor, Enigmatic Variation or Crossword to use him, but that could be down to my not having all the puzzles in those series. And so, the end of a delightful puzzle with some horribly tricky clues, but a thoroughly enjoyable dénouement. Thanks to Samuel, and to Pieman who, I’m sure, was there in spirit! This entry was posted on 1 June 2012 at 4:00 pm	and is filed under Solving Blogs. You can follow any responses to this entry through the RSS 2.0 feed. You can leave a response, or trackback from your own site.